The public transport network operates from 6:00 to 23:00 (some lines until 24:00, see timetable for further information). The ticket system works on a random-inspection basis, so you can board via any door and do not have to show anything to the driver. What you must have is a validated ticket, or you risk a 40 euro fine. Some riders are entitled to ride for free: children under school age (under seven), an adult travelling with a child under three years of age, and registered Tallinn residents (using a personalised Smartcard and carrying an ID). View, download or print the Tallinn transport map from here. Scroll down to read more about each ticket, which ticket to buy, and our tips for travelling with a group. Single-ride tickets are valid for one ride only. If you wish to use several connections during your trip, buy multiple tickets or opt for either a one-hour or a day ticket (see further below). A single-ride paper ticket can be bought from the driver for cash – exact change only – when you first board. The ticket costs two euros (one euro for ISIC Student and Scholar Card holders). Keep the ticket handy for the duration of the ride. A QR ticket is an electronic travel ticket with a rectangular barcode (QR code), which you can validate at orange validators at the front door of public transport vehicles. A QR ticket can be used for a selected number of trips, up to a maximum of ten. The number of trips must be selected at the time of purchase. Where to buy a QR ticket? QR tickets can be purchased online from tallinn.pilet.ee or with the mobile app pilet.ee (for iOS and Android). When buying a ticket through tallinn.pilet.ee, you can both download your ticket and have it sent to your e-mail address. If you create an account, your tickets will also be visible under ‘My tickets’. The mobile app pilet.ee is available on the Google Play Store and Apple App Store. When you purchase a ticket through the app, a service charge of 0.32 euros will be added to the price. How to use QR tickets? A QR ticket must be validated at the bottom of the rectangular validator located at the front door of the public transport vehicle: place the QR code displayed on a smart device screen or printed on paper onto the code reader screen situated at the lower part of the rectangular validator. A QR ticket which has not yet been used lasts for one year. You can use the QR ticket to pay for the single trips of several people (up to 10 in total). See ‘Tips for travelling with a group or family’ below for more information. A one-hour ticket is valid for 60 minutes, effective until the end of the last validated trip. NB! You must validate each entry. One-hour tickets can be bought onboard either by validating your Ühiskaart (see below) or with contactless payment cards (Mastercard, Maestro, Visa and Visa Electron) at the validators in front of the vehicle. The system tracks your daily use and automatically bills your Ühiskaart or bank account for the cheapest ticket you are entitled to for the day, meaning the maximum you will pay in a single day for an unlimited amount of trips is three euros (the price of a one-day ticket). One-, three-, five- and 30-day tickets can be loaded on your Ühiskaart online, via the pilet.ee app or anywhere the cards are sold. The green, plastic Ühiskaart is a fare card that lets you use the electronic ticket system. Buy one at any R-Kiosk, post office or the Tallinn City Government customer service desk for a two euro deposit (for refunds, see below), and then load it with credit or the ticket of your choice. How to use my Ühiskaart? At the beginning of each ride, you must validate your ticket by touching the travelcard to the orange validator located in the vehicle. A green light means your ticket has been successfully validated. A red light means your card is not valid or you are out of credit. With one card, you can buy one-hour tickets for yourself and up to five extra passengers (six in total). See ‘Tips for travelling with a group or family’ below for more information. How to top up my Ühiskaart? You can buy day tickets or add more credit to your travelcard anywhere the cards are sold. You can also top up via the internet (tallinn.pilet.ee) or using the pilet.ee app available on Google Play and the Apple App Store. Where can I get a refund for my deposit? The travelcard deposit can be reclaimed within six months of the first time the card was validated. • R-kiosks at Tallinn Airport, Railway Station (Balti Jaam) and Tallinn Port. If you have more questions about the Smartcard, you can contact the ticket vendors at +372 611 8000, info@pilet.ee or find more information on www.tallinn.ee. You can buy one-hour tickets with all Mastercard, Maestro, Visa and Visa Electron bankcards with contactless payment interfaces. When using your bank card to buy tickets on public transport, be sure to use the validators equipped with the wireless payment logo (in front of the vehicle). You cannot charge day tickets directly to your bank card. However, as the system automatically tracks your use and charges your bank account according to the cheapest ticket you are entitled to, multiple one-hour tickets in a single day will be calculated as a one-day ticket. 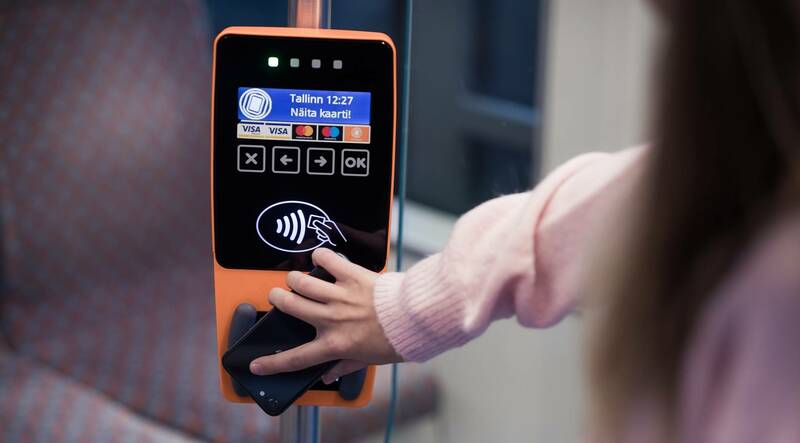 The Tallinn Card acts as a ticket, entitling the holder to unlimited, free public transport for the period the card is active. It also gives you free admission to museums and sights, a free sightseeing Tallinn City Tour with Tallinn Card PLUS and other discounts. The card is available for periods of 24, 48 or 72 hours. Each time you board a vehicle, you must validate the ride using your Tallinn Card. The plastic card can be validated the same way as the smartcard (Ühiskaart) - at every validator. With the mobile Tallinn Card, be sure to use the rectangular validators with the QR scanners located only at the front of the vehicle: place the QR code displayed on a smart device or printed on paper onto the code scanner at the lower part of the validator. Find out more about the Tallinn Card. If you plan to make only a couple of single trips (for example from and to the airport), buy a paper ticket from the vehicle driver or, for a cheaper, non-cash option, get the QR ticket online. If your trips involve connections or you wish to make multiple trips during one day, you should opt for a one-hour or one-day ticket. For that, you should either buy Ühiskaart or, if you are equipped with a Mastercard, Maestro, Visa or Visa Electron bankcard with contactless payment interface, buy it directly onboard. The system tracks your use and automatically charges you according to the cheapest ticket you are entitled to for the day (a one-hour or one-day ticket). However, if you are staying for more than one day and plan to use the transport system regularly, we recommend buying Ühiskaart and loading it with a day ticket suited to your needs. If you plan to visit several different museums and other attractions, think about investing in a Tallinn Card. Use their online calculator to get a glimpse of your savings. If you are travelling in a group or with family, see our tips below. If you wish to use the public transport system multiple times during a longer period, we recommend buying Ühiskaart for each member of the group and loading the cards with appropriate day tickets. If your use is limited to one-hour tickets or single trips, use one Ühiskaart (up to six one-hour tickets) or the QR ticket (up to 10 single trips). You can buy up to six one-hour tickets on one Ühiskaart. Just be sure to load enough money on you Ühiskaart online, via the app (pilet.ee) or at the various selling points. 1. Validate your Ühiskaart at any of the validators located in the vehicle. 5. If you are using a connection within the 60-minute timeframe, you only need to validate your ticket once in each following vehicle. When using one card for multiple people and if you make more than two trips at different times of the day, please keep in mind that the system will charge you for an appropriate number of one-hour tickets and will not recalculate them into day tickets (as is the case with single use). If your public transport use will be limited to single trips, then the most cost and time effective way to travel is to buy up to 10 single trips with the QR ticket. One of the major benefits of the ticket is that you can buy it in advance online or via the pilet.ee app. Just be sure to validate it at the orange rectangular validator at front of the vehicle, as it is the only one equipped with a QR code scanner. 1. Validate your ticket at the rectangular validator by the front door. 2. Use the arrows to select the corresponding number of extra tickets in the validator (up to nine). 4. Confirm the purchase by re-registering your QR ticket. Children under school age and passengers travelling with children under the age of three travel free without any validation or documents needed. If you wish to get the maximum out of your Tallinn trip, consider buying a Tallinn Card. With one adult card, you can bring along two kids under the age of seven free of charge.